The small, conservative town of Lynnfield has gone wild over local newspaper editor Jed Waterbury’s (Thomas Mitchell) decision to publish a racy, best-selling novel by Caroline Adams in installments. Little do they know, one of Lynnfield’s own is Caroline Adams. Theodora Lynn (Irene Dunne), an active community member and regular church-goer, published the novel under a pen name. Theodora travels to New York, saying that she’s going to visit her uncle John (Robert Greig) when really she is going to visit her publisher and make sure that her identity is being kept secret. The publisher, rather than reassure her, introduces her as Caroline Adams to his wife and the book’s illustrator, Michael Grant (Melvyn Douglas). Theodora’s secret is no longer very safe and she finds, upon return to Lynnfield, that Michael Grant has tracked her down in her hometown. Richard Boleslawski directs Theodora Goes Wild (1936), Irene Dunne’s first leading role in a straight comedy. 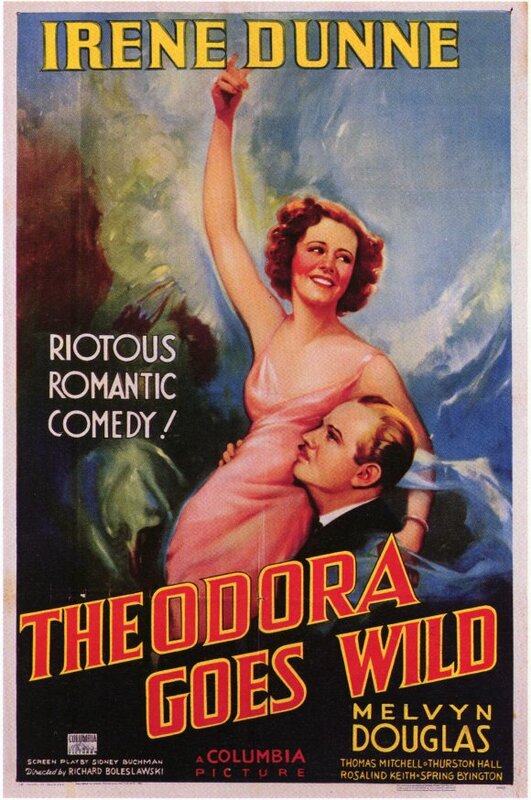 Theodora Goes Wild is a Columbia Pictures release, running at just over an hour and a half. One of the most striking things about this film is that it’s full of contrasts: stuffy, conservative ladies versus Jed, who is more than happy to publish the scandalous novel; the big city versus the small town; Theodora’s calm, steadfast persona as opposed to the over-the-top persona of her alter ego, Caroline. These differences make for a very interesting watch and often (such as in the case of Jed vs. the literary club) provide the film with quite a bit of hilarity. Dunne was admittedly nervous to star in this film and wasn’t sure that she could pull off a completely comedic role. However, while watching the film I wasn’t aware that this was her first comedy, and I wouldn’t have been able to tell. She was the perfect choice for the lead, because she has an air of sweetness which allows her to easily pull off the role of Theodora. It is easy for the viewer to see how she would have been able to hide the fact that she wrote the book, because she seems quite innocent. Not only is Dunne’s performance captivating, but the wardrobe department also did a really great job with her here. Like the contrasts in the personalities of Theodora and “Caroline,” Dunne’s outfits range from cute, everyday “normal lady” wear to extravagant, furry city glamour. Melvyn Douglas also gives a great performance as sneaky Michael Grant. His character is snarky, a bit obnoxious and very persistent in his goal to help Theodora loosen up. A very fun sense of tension is built between the two characters, and the conflict between them brings a lot of laughs for the viewer. Though they start out virtually hating each other, the story takes the two on a rollercoaster, flip-flopping between conflict and cuteness. The chemistry between Dunne and Douglas is good enough to pull this off, and Dunne in particular wins the audience over and gets us to root for the couple. Overall, Theodora Goes Wild is a very fun screwball comedy and cute romance. The plot holds a few unexpected surprises – just enough to keep the viewer hooked. 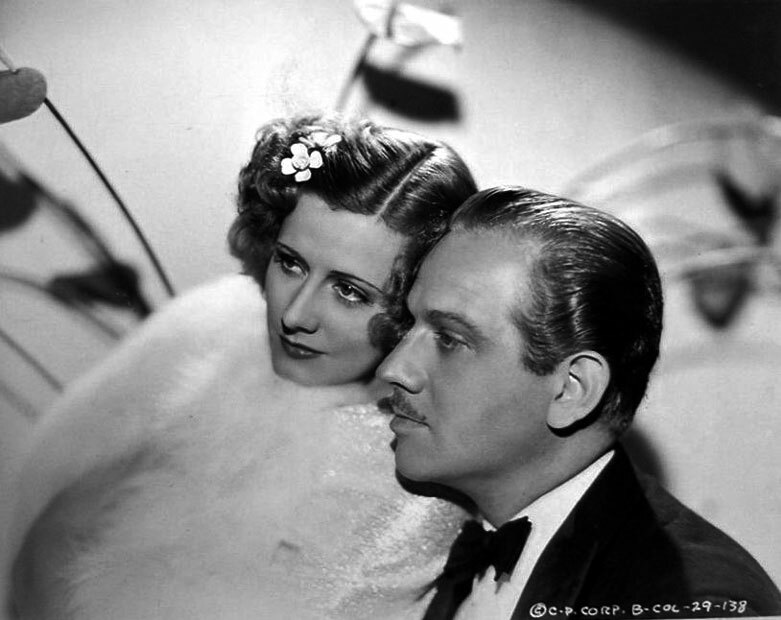 It’s more than worth a watch, especially for fans of Irene Dunne and/or Melvyn Douglas. Irene Dunne is so lovely in this comedy; like you say, it’s hard to believe it was her first all-out comedic effort, she’s so comfortable in what she does. I agree that Melvyn Douglas’ character is a bit obnoxious; and he also turns out to be not as free-spirited as he pretends. The true free spirit is Theodora herself! I love this movie, and it’s always amazing to me that Irene Dunne was nervous about doing comedy! She’s a natural! I love this movie, and I think you’ve made an excellent point about all the contrasts. I particularly enjoyed the change of wardrobe for Theodora; the costumers must have had a field day coming up with the designs for the “wild” segments of the movie. It is hilarious that Dunne initially didn’t want the role, but I’m so glad she took it because then we probably wouldn’t have all the rest of her comedies! That’s a really great point. I can’t imagine her having no comedies at all in her filmography. Even if this film was terrible I’d have to be glad she took the role for that reason alone, but luckily it’s a great film!